With each passing hour, we’re learning more and more about the bizarre past of Las Vegas shooter Stephen Paddock. Now we learn Paddock booked rooms at the Blackstone hotel in Chicago overlooking Lollapalooza two months before the Las Vegas mass shooting. Stephen Paddock had his sights set on Lollapalooza in Chicago and even booked 2 rooms in a hotel that overlooked the massive outdoor venue … TMZ has learned. Check out this pic of a computer screen at the Blackstone Hotel in Chicago, located across the street from the venue, Grant Park, where 400,000 people — including Malia Obama — squeezed in over 4 days to watch big musical acts. Paddock booked one room for August 1, 2017, 2 days before the August 3 kickoff. Paddock then booked a second room for an August 3 arrival. Both rooms had an August 6 checkout … that’s when Lollapalooza ended. The hotel directly overlooked the main stage as well as several adjoining stages. It also overlooks the main entrance and exit where thousands of people file through. And the hotel had a bird’s-eye view of the crowd. A new report reveals the high-stakes gambler bought a “a 2,000-square-foot, two-bedroom stucco rambler on a cul-de-sac,” in cash. 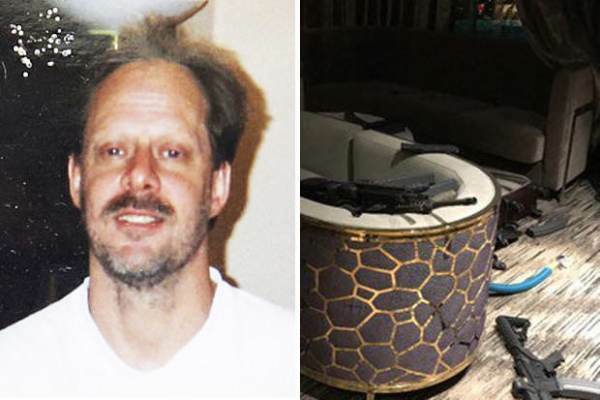 Paddock made sure the home was in a private area of the community. He seemed so ordinary, just another house-hunting retiree, when he strolled with his girlfriend into the sales office of the Sun City development in late 2014. The agents had just what Stephen Craig Paddock was looking for — a 2,000-square-foot, two-bedroom stucco rambler on a cul-de-sac. Other houses might offer bigger floor plans, but the one on Babbling Brook Court had two big selling points: a commanding hilltop view and, perhaps most importantly, privacy. Neighbors lived to the left and right, but none behind the home. Paddock quickly said he’d take it. He stood about 6-foot-4 but came across as “low key and relaxed, a good guy,” one of the real estate agents recalled, speaking on condition of anonymity. Balding and paunchy, Paddock was the opposite of flashy. On his application, he said his income came from “gambling.” He gambled about $1 million a year, he told one of the agents. And he paid cash for the house, the agents said — $369,022. As TGP previously reported, officials with the Bureau of Alcohol, Tobacco and Firearms told CBS News on Wednesday that Las Vegas killer Stephen Paddock purchased 33 guns in the last year since October 2016. That averages out to around three guns per month.